Using an aging laptop and desperately need a new one? 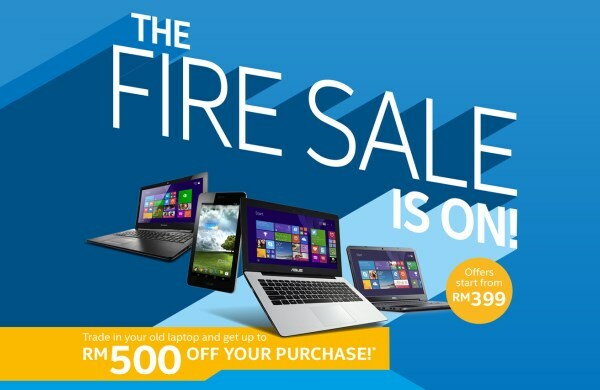 Well, here’s a good news for you: Intel together with several of its OEM partners and Microsoft will be having the Intel Fire Sale this week at Plaza Low Yat, Kuala Lumpur. The sale is part of the company’s on-going PC Refresh campaign and it will take place for only 3 days; from 26 to 28 June. It will be hosted by a retail store called Firestorm that is located at the ground floor of the famed IT mall and customers will able to receive rebates of up to RM 500 by trading in their old laptops. According to the list, 17 products are involved in the Intel Fire Sale which come from Acer, ASUS, Dell, HP and Lenovo. In addition to the rebate, Intel is also giving away a gold bar worth RM 3,000 and fifteen RM 500 discount vouchers on daily basis throughout the Intel Fire Sale period. Not enough with that, there will also be more than 400 computer accessories available for only RM 1 each during the sale. While the site is already online, the sale’s T&C page is not yet available at the moment. Hence, at the moment we have no clue on what are the requirements that customers need to adhere during Intel Fire Sale promotion. So, keep a constant look at the website – pcrefresh.intel.my/firesale – for further updates.